Review: "Wall Street: Money Never Sleeps"
It would hardly have been shocking for director Oliver Stone take a victory lap with “Wall Street: Money Never Sleeps,” feeling that his views on greed and economics have been vindicated by the recent global financial collapse. But Stone resists, instead spreading the blame around -- even to the little guys -- while offering a well crafted scale model of how the current financial crisis came to be. “Money Never Sleeps” opens with Gordon Gekko (Michael Douglas) checking out of prison with an empty money clip and a cell phone the size of an infant. Meanwhile, young Jacob Moore (Shia LaBeouf) is learning the business of Wall Street at the knee of Louis Zabel (Frank Langella), and, coincidentally enough, is shacked up with Gekko’s estranged daughter, Winnie (Carey Mulligan). Greed, for lack of a better word, is good. Greed is right. Greed works. Greed clarifies, cuts through, and captures, the essence of the evolutionary spirit. Greed, in all of its forms; greed for life, for money, for love, knowledge, has marked the upward surge of mankind and greed. 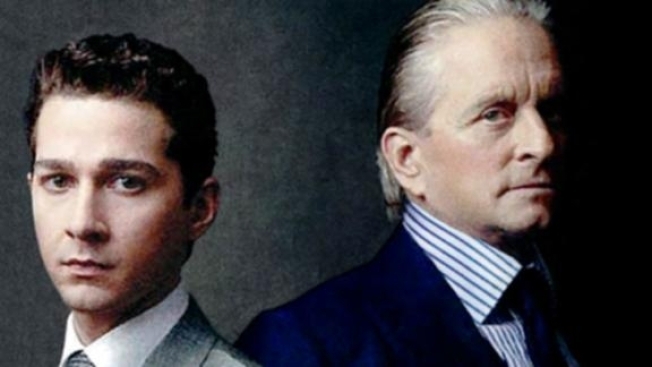 Douglas is again great as Gekko. Though he has no epic aria to be regurgitated by aspiring titans and raiders, the new Gekko is a far more complicated character requiring greater range and nuance. The ’87 vintage was a heat-seeking missile, the ’10 model is much more dangerous. LaBeouf inches closer to leading man status with his turn as Jacob, but his efforts to convey anger read more like petulance – in a face-off with Josh Brolin (giving his second great performance of the year) he looks like a paper boy insisting he’s been shortchanged. And Jacob never has the crisis of conscience that Bud Fox (Charlie Sheen, who reprises his role from the original with an amusing cameo) endured. Bud sold out his old man and his union buddies to make a buck, Jacob just shows poor judgment a few times. As for Mulligan, she's utterly wasted as the younger Gekko, Winnie is merely a chess piece at the whim of men chasing money. She cries and shouts convincingly, but the part doesn’t call for a woman of Mulligan’s talents. Though Stone gets a lot right, he does get a few things wrong. He throws the phrase “moral hazard” around like a little kid trying out the F-word for the first time, and has two of his characters try to define it, with neither really coming close. One walks away wondering if Stone actually knows what it means. And the idea that Gekko would have to tell Jacob about "Tulipmania" is utter nonsense – if Moore is the man he pretends to be, he could write a thesis paper on Tulip mania without cracking a book. If Stone really wanted the story in his film – and clearly he did – he should’ve had Jacob explain to Winnie. The fans go crazy as Michael Douglas and Catherine Zeta-Jones hit the red carpet for the premiere of "Wall Street: Money Never Sleeps." Co-stars Josh Brolin, Shia LaBeouf, Carey Mulligan and more talk about Michael's brave battle with cancer. With “Wall Street: Money Never Sleeps” Stone has essentially done for the global economic fiasco what he did for the Kennedy assassination in “JFK” – turned one of our nation’s biggest disasters in to an easy-to-understand and entertaining crime thriller.